Come in to Outback and get a FREE Bloomin’ Onion* on Monday, June 30th! 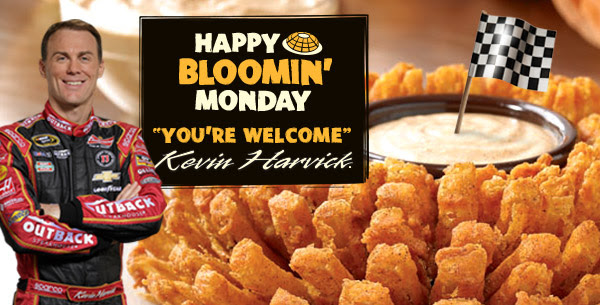 It’s a Happy Bloomin’ Monday™ because Kevin “Happy” Harvick finished in the top 10 this weekend. Just say “Bloomin’ Monday” to your server. Sometimes, sweet, sweet success tastes like a free, free Bloomin Onion. No coupon needed! Thanks Kevin!